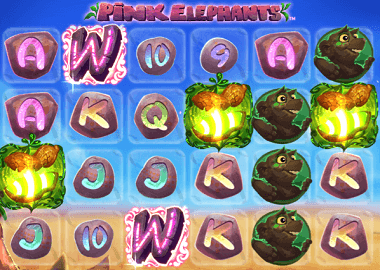 Thunderkick’s Pink Elephants Slot is a six reels slot with four rows and 4096 ways to win. It means your symbols must end up side by side on the reels. The set is a desert and next to your animated icons you’ll see a bonus tree. The Pink Elephants Slot has up to 5 Mystery Scatters, a Free Spins feature and a Bonus Game. You can spin the reels from 10p up to a maximum of £100. The top prize is very impressive, because you can win up to 8200x your bet! Play the slot on all devices including Smart Phones and Tablets. Symbols and payouts: The symbols of Pink Elephant Slots are themed symbols and the familiar poker cards symbols. 9, 10, J, Q, K and A pay you up to 3x your bet per ways to win. The themed icons are a series of creatures and the Pink Elephant symbol. This is also your most valuable symbol and pays you up to 100x your bet. You also play with a wild symbol and the mystery scatter symbol which is a fluorescent green peanut. Mystery Bonus feature: The mystery bonus feature is triggered by the Mystery Scatter symbols. In the base game land up to 5 Mystery Scatter on your reels and increase your chance to trigger the bonus game. You can also land 3 or more peanuts scatter symbols on your reels and you get up to 19 free spins. In the Free Spins you get re-spins when you land 2 or more scatter symbols on your reels. You can also fill the symbols meter by collecting elephants. Again, you will get an extra free spin each time. Free Spins feature: If you land 3, 4, 5, or 6 scatter symbols on your reels during the bonus game, additional free spins will be triggered. You then play 3, 5, 7, 9 or 11 additional free spins. You can also convert up to 4 symbols and thus land up to 4 pink elephants symbols on your reels. You can play up to 34 free spins in this way. The converted symbols are paid up to 8,200x your bet. The Pink Elephants slot is all about thee free spins and a high volatile slot. We offer a whole range of UK online casinos, which also have Thunderkick slots. First of all we want to point out that you can play the Pink Elephants slot for free. Simply click on the slot banner above. At Casino Cruise we also have an exclusive bonus offer. Play 55 Free Spins without deposit after your registration. There and in Spinit Casino, Sloty Casino or Genesis Casino there is a huge selection of Thunderkick online slots. In all casinos you get bonuses and free spins for the start after your registration!